Today was a fabulous day! The weather was warm and breezy. We began our day with a visit to the shrine of the Virgin of Guadalupe .She is a symbol of significant importance to the Mexican people. The shrine is located in a beautiful, lush garden. I felt privileged to be there.There were people who had walked a very long way to visit and they were singing at the shrine. Then we drove by bus to the market town of Tlalpujahaua. 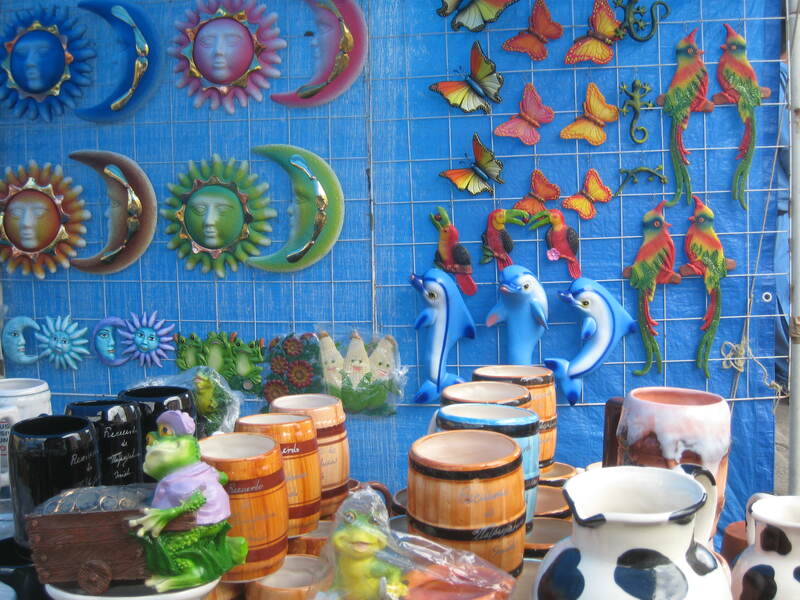 We joined the local people who shop for pottery,fruits and vegetables in the town's outdoor market. We saw a preschool class holding a Valentines Day Parade through the streets . There was a band playing . It was very festive and colorful !We ate lunch at a restaurant that was built on an old silver mine. It was like eating in a cool tunnel. There was a young man weaving pine needle baskets there. I bought one for our classroom. After we left the Tlalpujahaua we got back on the bus to go to our hotel for the night. We stopped along the way to photograph some of the giant maguey plants and nopal cactus that grew along the side of the road. We got to taste cactus during our week in Mexico. Our guide Marcos also showed us how a needle and thread can be made from the tip of a cactus and the fiber inside. We aslo got see a cowboy at work before we left the field of cactus! We are staying in a beautiful Hacienda and will go to the butterfly colony of Chincua tomorrow.